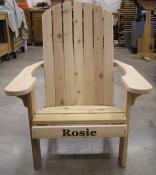 Wedding present: Personalized redwood love seat glider. Trust the Journey -- Adventure Awaits! Colleagues signed this rocker for a retiring co-worker before it was stained. Life, Laughter, Love in Norwegian; stained with Cabot`s Australian Timber Oil-Natural. 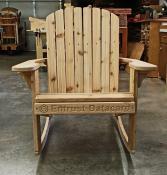 Entrust Datacard's company logo is carved on the front slat of this Big Boy rocker. 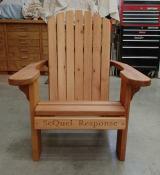 Standard Redwood Adirondack Chair stained, with two carvings. 3 hearts and wine glass holders on redwood Adirondack chairs. 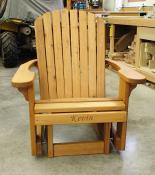 Matthew carved on a Youth Chair and stained with Cabot`s Natural Australian Timber Oil. Stained or painted? These samples show a board and a name that`s been stained with Sikkens (top) and a name that`s been carved and then painted on an unstained board (bottom). 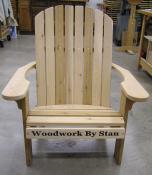 Now you can have your name -- or your significant other's name, your business name or anything you want -- professionally carved into your chairs, love seats, gliders, benches, even your tables. I've got this toy. Well, it's not really a toy. It's a CarveWright -- a mini-CNC machine -- and it's a far cry from the jackknife used to crudely carve a sweetheart message on the backyard tree. 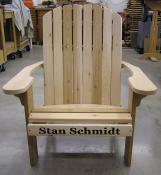 I can carve a name on the front of any chair, glider, rocker, bench or love seat in our product line -- including the Adirondack Junior Chair. The cost? Only $25 per board.